But you don’t look disabled… why are you using an accessible toilet? I’ve written before about people who abuse accessible toilets and don’t need to use them by their own admittance. However, amongst people who walk in and out with no obvious mobility, sensory or learning difficulty are people with hidden needs for these facilities. 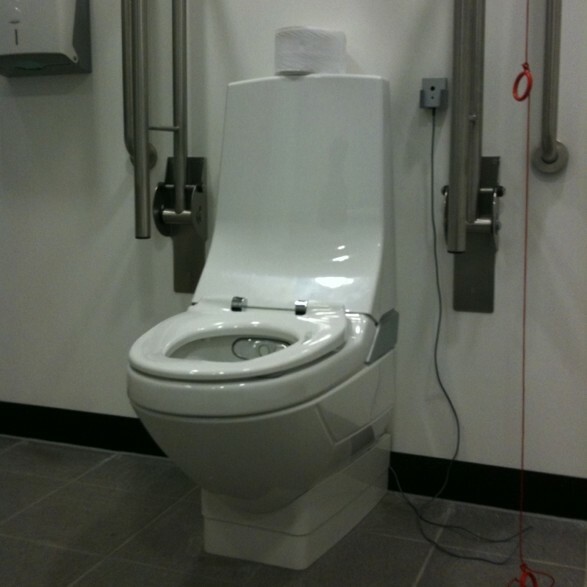 Sherrill Hawker has written an excellent post for us, as our guest blogger, about why she often needs to use accessible toilets when she doesn’t look disabled. This is what I am sure many people think when they see me go into a disabled toilet, especially when I use my RADAR key. I am sure people think that I am just trying to skip the queue when I hop into an empty disabled toilet, but this really isn’t the case. I don’t overly care what people think but I guess there is a small part of us all that doesn’t want people to think we are ignorant morons! And by that, I mean I would never park in a disabled bay and if I did I am sure people would secretly tut tut at me for doing so and so I suppose I don’t want people thinking that of me when I use a disabled loo. You see, I have an Ostomy, which means I wear a stoma bag which is attached to my stomach to collect waste from my small intestine. I had a debilitating bowel disease called Ulcerative Colitis which got so bad that I had to have emergency surgery to remove my large bowel. I don’t look disabled, there is nothing you can see by looking at me that would indicate my need for disabled facilities, I am not in a wheelchair, I don’t have any missing limbs, I am young and look fit. But what you don’t see is my stoma bag I wear beneath my clothes, the bag that fills up gradually over the day, the bag that needs emptying regularly, the bag, that if not emptied will burst and I will end up covered in poo. No-one knows you wear a stoma bag, it is impossible to tell, they are surprisingly discreet, but it is something we have no control over, we can’t tell it not to fill up, we can’t hold on to it until it is more convenient. So when the need arises to empty, I personally prefer to do it in slightly more private surroundings. Like any poo, it smells, but unlike (and I know this may be a bit TMI!) people with large intestines, it is more acidic, more raw, it hasn’t gone through the usual bodily processes. So it’s nice to have some privacy and not feel paranoid about the smell. Now, I generally don’t care what people think, I am not going to see them again, and when I have to use a ‘normal’ toilet I have deodorising sprays and perfume which helps, but I still like the privacy. There are also times in which I may need to change my bag, it is rare, as once done at home I tend to be ok for the day but every now and then, the inconvenient leak happens which requires a change of bag. Can you imagine trying to manoeuvre yourself in the smallest cubicle known to man, having to deal with changing a bag and all the paraphernalia that goes with it, plus the need for access to water? Unfortunately, people assume that to use a disabled toilet you must look disabled, what people don’t realise is that there are people like myself who need use of a disabled loo. I think the worse thing for me is when I may go to a busy bar or club on a weekend. It fills me with dread that I may need to use a ‘normal’ toilet to empty, as I have said, I am not ashamed, but on a busy weekend, where alcohol is involved, people are unforgiving and not backward about coming forward if they think the cubicle smells. It’s a horrible experience and one I try to deal with as best I can, I just get on with it, but it is these times especially that I prefer a disabled loo. But you know what? In a busy bar or club the disabled toilet tends to be locked and only a member of staff can open them (they often don’t use the RADAR key system). This means that I have to find a member of staff to open it for me and then I am having to explain why I need to use it when they tell me it is for disabled people only!! I could name and shame but I won’t, but the point is that I don’t want to have to explain myself to anyone, why should I? I understand that they are worried about drugs but why should those of us that don’t look disabled need to explain our reasons? Fortunately (well the majority of the time) it isn’t an ‘emergency situation’, when I had Ulcerative Colitis (which basically means you have barely any control over your bowels) if I had to stop to ask for a key or try to find a member of staff then I may have sh** myself there and then!! So, I guess what I am trying to say is don’t judge those who don’t look disabled but need to use a disabled toilet, bars & clubs listen up and do something about your locked disabled loo situation so those like me, don’t have to explain ourselves and if you walk into a toilet cubicle that smells, before you turn your nose up in disgust, just think that someone may be really suffering. http://ibdostomylife.blogspot.co.uk – Toilets Trees and other things.